When deciding on this month’s baking feature, I knew it was going to be something savory and memory-filled. And one specific food that follows both of those themes is biscuits. 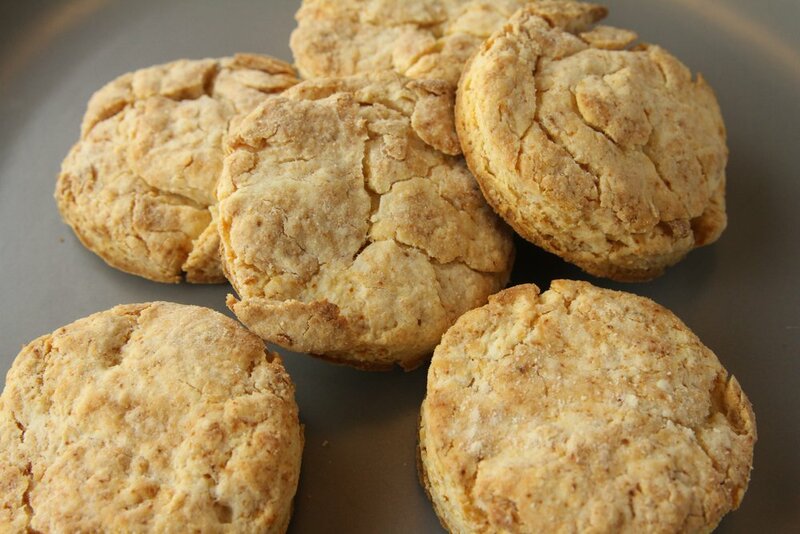 Who doesn’t love a hot, buttery, flaky, and scrumptious biscuit? I, for sure, adore them, but have not been able to find a suitable replacement for one of my favorite breakfast items since my Celiac diagnosis. Below you will find three different recipes for buttermilk biscuits and the (delicious) results of each one. Enjoy! And welcome to February’s buttermilk biscuit bonanza! Recipe: For my planning, I researched a lot of biscuit recipes from many cookbooks and online articles. Man, I was craving them all of the time while I read up! Finally, I zeroed in on three that included the same ingredients, but in different amounts and slightly different techniques to create the dough. While I was tempted to make four, five, or even more different ones, I came to my senses and realized three would suffice. Especially since the three I picked worked out beautifully. In fact, I would say each one is perfect for a different biscuit-invloving scenario! The first two recipes are available online and the third can be found in the cookbook listed. Memory Lane: Since every baking adventure revolves around a food memory, for me at least, I’d like to share with you how my passion for biscuits began and why they continue to be so important to me today. Growing up, my love for breakfast was especially felt on the weekends (Sundays to be exact), and to manage that I would always want something fairly involved. Since I was also very young and small, that “extravagance” meant a bagel, most of the time, with appearances made by French toast or pancakes here and there. I loved it all. However, nothing could compare to the ultimate in Sunday-breakfast-joy: Sunday breakfast at McDonalds. At least one Sunday each month, my grandfather and I would feast at McDonald’s and enjoy a hearty breakfast. We would go early in the morning, since we are both morning-people, and he would let me order whatever I wanted. While he stuck to his standard order of “hot cakes and black coffee,” he always knew I would order too much and then share some with him (sometimes). Those hash browns were too good! He knows me well! I tended to reliably order too much food, but I was always too excited by the prospect of having hash browns, pancakes, and biscuit breakfast sandwiches all in one meal. Of note, no one else was ever allowed to join us for these Sunday breakfasts, not even my grandmother - I declared this often for some reason (how rude!). It was our “thing” to dine amidst the crowds (read: 4 other people) early on Sunday mornings at McDonald’s and chat about the world around us. A ritual that we still reminisce about to this very day. This was a tradition we stuck to for countless years until we realized (acknowledged?) that much higher quality breakfast foods were available elsewhere and we eventually changed our location. Fast-forward to recent years and while we don’t gather at McDonald’s, we both definitely still appreciate a hearty, scrumptious morning meal (gluten free for me). And I’m proud to say, as a grown up, I’ve inherited his love for ultra-hot black coffee. So how does this all come back to my biscuit bonanza? Well, you see, I really loved those bacon, egg, and cheese breakfast sandwiches (on a biscuit) available at McDonald’s (I always ordered two!) and so I’ve decided to recreate those here for you, in all of their now-gluten-free glory. And while I cannot guarantee them to be “exactly like” the ones served over at the Golden Arches, I dare say the biscuits I’ve made taste even better and definitely bring back every single memory of those Sunday morning breakfasts with my grandfather (Papa). Make + Bake: While the ingredients remained the same for all three recipes, the amounts varied slightly as did the dough preparation. The consistency across recipes made me realize that with each time I made them, my confidence in kneading gluten free dough rose significantly, and my ability to tell when things were “ready” improved as well. I’m a firm believer in practice makes perfect; although I’m not striving for perfection, just a delicious biscuit. SK: Since the recipe was scaled down by the author to make fewer biscuits, I assumed that meant that they would be smaller biscuits overall, which they were. However, this doesn’t seem to be due to the recipe quantities, but moreso my beginner-level biscuit making ability. I used a wooden spoon and whisk for all mixing in this recipe. I chopped butter into small chunks with a knife rather than pulling it apart by hand. And I used a wine glass instead of a biscuit cutter to form the final discs - wise move! The smaller size was cute, but I think that hindered the success of this first attempt. BA: The most intricate instruction when it came to kneading and forming the dough (lots of layering), but this recipe taught me the best trick overall. Always put your parchment-lined baking sheet of biscuits in the freezer for about 10 minuets before baking. Lesson learned! This is a tip I’ll take with me for all future biscuit creation. Also, these were basted with butter before being baked. Smart move, BA. Yum! DI: The most fun recipe of them all since I was “in the zone” for the entire process. Based on the other recipes, I knew everything had to be done by hand to get the outcome I now craved. Conveniently, the recipe indicated to use your hands at every step; I dutifully obliged. So yes, I was a buttery and floury mess, but I’m pretty sure that was a key to their success. Also, these biscuits were basted with buttermilk before being baked (and I chose to freeze them briefly). This made a big mess since we had buttermilk spilling all over the oven, but it was worth it. 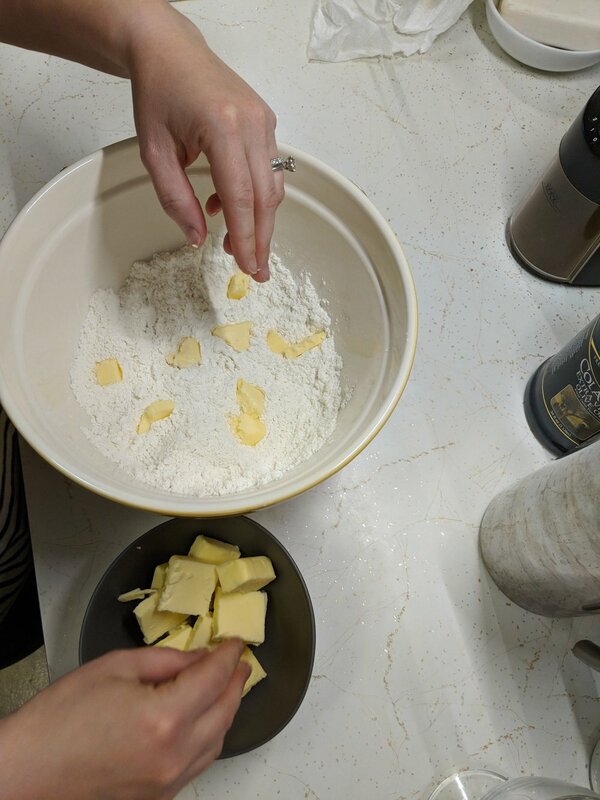 Baking Tips: Well, since I had never made biscuits before, and am a bit of a neat freak, I kept my baking area clean throughout each batch, and pre-measured everything most of the time so that I wouldn’t have to keep reminding myself of ingredient measurements. Of note, I often go so methodically through each ingredient and where it has to go (in which bowl) that you may not even realize I’m making something since I clean up the countertop as I go. Madness, I know. 2. Fear not - you won’t taste that tiny bit of sugar that they all include. 3. All of these recipes use unsalted butter. I bought the best quality available and am convinced it makes a difference in the final flavor. 4. Use your hands to incorporate the butter into the dry ingredients. And again while adding the buttermilk. Messy can be fun! 5. A wine glass is a great biscuit cutter or a sharp knife to make the rectangular-shaped option. 6. While each recipe doesn’t make too many biscuits, it’s OK. Bigger, flakier, and taller is a better outcome than more of them that are smaller and less scrumptious. The rectangle-shaped dough won’t be that big, but it will be thick. And that yielded, for me, the better biscuits. 7. Always freeze the biscuits before baking for about 10 minutes. Then baste with butter or buttermilk. 8. Don’t forget to baste! It’s the best. 9. Eat these buttery wonders very shortly after they come out of the oven. We found that they’re perfect same-day, but need a little zing in the toaster oven to awaken the joy the next day. Shelf life for gluten free biscuits seemed to be about four days, but possibly longer if frozen. Don’t store them in plastic! You’ve been warned. Outcome: This was a delicious adventure. And my passion for buttermilk biscuits remains as strong as ever as well as my adoration for biscuit breakfast sandwiches. In terms of baking, I learned a lot about moving quickly when using cold butter and know that I need to continue to work on my kneading technique. However, overall, we came out with three delicious batches biscuits! OMG Yum. May our kitchen smell this good forever. Notes on the final results from each recipe are below. SK: While my next iteration of these will be proudly better, I was thrilled with the cute size and crisp texture of these buttermilk biscuits. And the flavor was scrumptious hot out of the oven. Now that I’m a bit more well-versed with the dough, I know how to make them taller and bigger for next time. BA: Determined to make the second biscuit batch bigger, brighter, and taller, this recipe required me to up my dough-making game. While we used an electric mixer to blend the ingredients (ever so slightly), I think this enhanced the dough overall. My skills were tested when the recipe called for me to slice and layer, and slice and layer (again) the dough so that lots of layers of butter were formed before creation the biscuits. Whatever you say, BA! It worked. After forming the biscuits, freezing them briefly, brushing with butter, and then baking them to golden perfection, I was swooning in my kitchen. These were good. I loved all of the layers as well as the semi-impressive rise they had out of the oven. Plus, the taste was spot-on! Bonus feature? These biscuits tasted great for days afterward and stayed pretty fresh in the kitchen covered in foil (although even better when toasted for a few minutes). A gluten free biscuit win! DI: OK, so I know I didn’t have to make a third version/recipe of gluten free buttermilk biscuits. I was so happy with the first two and completely achieved my goal of making a delicious GF biscuit breakfast sandwich. Then why did I embark on a third biscuit journey? Because I’m a glutton for butter and knew that my third attempt would somehow be my best one yet. Thankfully, I was correct. After reading the story behind this recipe and how it came to be, I knew these would be the “luckiest biscuits” for me as well. Little did I know before I dragged out the flour for round three that later this same Sunday we would find our new home. Lucky biscuits, indeed! Yup, we are moving to a brand-new apartment! I cannot wait. But, back to the biscuits. These. Were. A-Mazing. Was it my laser focus throughout the dough-making? Was it that I used my hands to break apart chunks of butter that I then carefully added to the dry ingredients? Or was it that I hand-mixed the dough once again after the buttermilk had been added? So squishy. We may never know. Fresh-made biscuits, bacon, and eggs. The ultimate breakfast. What’s Next? For my upcoming feature, I’m debating some sweet treats! Seth’s birthday is very soon and I just might have to make him a baked dessert buffet (think: cookies, cakes, oh my)! Tune in next month to find out about my March baking adventure! Gluten free buttermilk biscuit breakfast sandwich.